Share your Wisdom! Sign up to become a mentor and help a new attorney learn from your experience. We need volunteer mentors for the 2018 program. Please apply today at https://www.isba.org/mentoring/mentor. IllinoisLawyerFinder, the ISBA's new public lawyer directory, is now live and viewable by the public! Go here for detailed instructions on how to access and edit your new directory profile. Now you can see just how valuable section membership is! 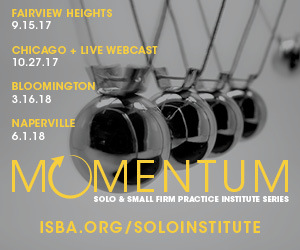 Go to www.isba.org/sections and click on any section's prospectus to view what they accomplished during the 2016-2017 bar year. A message from LRE Chair Kateah McMasters. Learn more about the Association for Conflict Resolution and its upcoming Conflict Resolution Day. Author and attorney Kristie Fingerhut shares how she helped to bring legal education to her daughter's Girl Scout troop. The Jones Act has been in the news lately, most particularly with calls for waiver of the Act. But what is the Jones Act? Opportunity Grants are intended to be one-time awards to start or enhance a program of law-related research, education, or public service projects. Veterans Day is fast approaching: What will you be doing and why? For a large part of our population, the history of the establishment of Veterans Day is unknown.